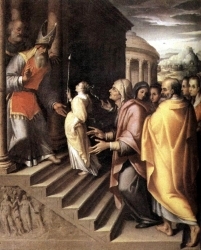 The daughter of Gioacchino Merloni, a wealthy and influential industrialist, and Teresa Brandinelli; Clelia was baptized in the diocesan cathedral of Santa Croce in Forli, Italy when she was only a few hours old. Her mother died in 1864 when Clelia was only 3 years old; her maternal grandmother and her step-mother, Maria Giovanna Boeri who married Gioacchino in 1866, raised her to be a pious girl with a good education. Her father became so involved in succeeding in business that he became openly hostile to religion in general, joined the Freemasons, and became specifically anti–Catholic. He planned to have Clelia follow him into business, but she was drawn to religious life which led to family strife as he blamed the women in the family for turning Clelia against him. Clelia responded by praying for him and doing penance in reparation of her father‘s actions. He was reconciled to the faith before his death in 1885. Freed from her family obligations, Clelia joined the Figlie di Santa Maria della Divina Provvidenza (Daughters of Holy Mary of the Divine Providence). In religious life, she felt a calling to start a congregation devoted to the Sacred Heart of Jesus, and eventually founded the Apostole del Sacro Cuore di Gesù (Apostles of the Sacred Heart of Jesus) in Viareggio, Italy on 30 May 1894. Internal disputes, including corruption and theft by Clelia's finance administrator, led to her leaving the order in 1896; the adminstrator was a priest, and Clelia refused to bring in civil authorities for fear of causing scandal and stirring up anti–Catholic sentiment. But on 10 June 1900, with the approval and support of Blessed Giovanni Battista Scalabrini, bishop of Piacenza, Italy, she returned to religious life, was accepted back into the Apostles, and helped set them up on their new work as missionaries to Brazil. Following the loss of support caused by the death of bishop Scalabrini in 1905, the internal strife in the Apostles erupted again, support of Clelia declined, and in 1911 she was replaced as Superior General by the Vatican. Clelia withdrew from public life, and in 1916 received dispensation to be released from her religious vows. However, late in life she requested to re-enter religious life, and on 7 March 1928 became a simple sister in the Apostles. The Apostles, whose motto is "The Love of Christ Impels Us", continue their good work today with 1,200 sisters based in 195 houses in Italy, Switzerland, Brazil, Argentina, Chile, Uruguay, the United States, Mozambique, Benin, Albania, Taiwan and the Philippines, focusing primarily on education. Devotion to the Blessed Virgin Mary in the image of a cedar statue in Quinche, Ecuador. About two foot tall, it was carved in 1586 by Don Diego de Robles, an artist who created many other images of Mary. He carved it on order from the Lumbici Indians, who were unable to pay for it at delivery. Diego traded the statue to the Oyacachi Indians in exchange for a large load of cedar for future projects. Legend says that the vision of Our Lady appeared in a cave to some of the Oyacachi, promising to the protect their children; the image Diego brought for trade looked just like the lady in the vision. The Oyacachi asked Diego to stay and help them build a shrine for the statue; he declined and started home. His horse threw him as they crossed a bridge, and Diego was miraculously saved after he had prayed for Our Lady's intervention; he understood that this was a sign, went back to the Indians, and built an altar for the statue. In 1604 the statue was moved to the local village of Quinche and a chapel was built for it. A new sanctuary was built in 1630 where the statue stayed until the church was destroyed in an earthquake in 1869. The church was re-built, and housed the image until moved to another new church in 1928; in 1985 the Vatican proclaimed the chapel to be a national sanctuary of Ecuador. Many miracles, especially healings, have been associated with the image, and there is a huge catalog of songs in several languages that have been written in devotion over the centuries. Commemorates the presentation of the Blessed Virgin as a child in the Temple where, according to tradition, she was educated. The feast originated in the Orient probably about the 7th century and is found in the constitution of Manuel Comnenus (1166) as a recognized festival. It was introduced into the Western Church in the 14th century, abolished by Pope Pius V, but re-established by Pope Sixtus V in 1585. Its observance by the Society of the Sacred Heart of Jesus as the day of their origin led to the devotion of Mater Admirabilis. Among the many masters who have represented this subject are: Alberti, Fra Bartolommeo, Biagio, Agostino, Carracci, Cima da Conegliano, Cossa, Holbein the Elder, Palma, Piombo, Tintoretto and Titian. Eldest daughter of Adolf Adam Siedliski and Cecilia Marianna Morawska, wealthy and aristocratic landowners in the part of Poland which was occupied by Russia. In her late teens, Franciszka felt the call to religious life, which was against her family wishes as they were very indifferent Catholics; her father said he would rather see her dead then lost to the cloister. Founded the Sisters of the Holy Family of Nazareth on 1 May 1884, taking the name Sister Mary of Jesus the Good Shepherd. Born to the Venetian nobility. Benedictine monk at the monastery of San Niccolò del Lido in Venice, Italy in 1153. After all his brothers were killed in combat outside Constantinople in 1172, Nicholas received dispensation from Pope Alexander III to return to secular life. He married Anne Michieli, the daughter of a Venetian doge, and was father of nine. In 1179 Anne agreed to let him return to his calling to religious life, and he spent his remaining years at San Niccolò del Lido; a few years later, Anne became a nun at the convent of Saint Blaise near Venice. Son of an African immigrant named Valerius. Priest. Pope. Known for his learning, charity, and sense of justice. Opposed the Acacian and Manichaean heresies. Came into conflict with the Patriarch of Constantinople over supremacy in Alexandria, Egypt and Antioch. Suppressed many of the Roman pagan festivals, and ordered the reception of the Eucharist under both species, settling the argument of the proper form for Communion. Wrote for liturgical sacramentaries, and some of his work appears in the Leonine Sacramentary. Monk for 18 years. Pilgrim to Rome, Italy. Bishop of Porec, Istria. Martyred in the persecutions of Diocletian. Arrested three times during the persecutions of Diocletian, but released each time. On his fourth arrest he was imprisoned for two years, then offered his freedom if he would renounce Christianity; he declined. Martyr. Benedictine monk. Abbot of San Vincenco, Volturno, Italy for 34 years, resurrecting the monastery as a center for learning and missions. Benedictine nun. Abbess of Susteren Abbey. Born to the 5th-century nobility, the son of Constantine, a lord in Cornwall, England. The village of Llangernyw, Wales is named after him. A 1st-century Christian greeted by name by Saint Paul the Apostle in the Epistle to the Romans 16:13. Bishop of Verona, Italy. Late in life he retired to become a hermit. Three Christians martyred together for their faith during the persecutions of Diocletian. The only details about them to survive are their names - Eutychius, Honorius and Stephen.